Editor's note: Written in memory of Rev. William M. Minerd, father of Ethel Hetzer and 9 brothers and sisters. Ethel was the grandmother of author Elaine (Monticue) Brawdy. When Rev. 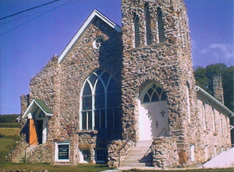 Minerd died, he was a pastor of the Somerset Circuit of the United Methodist Church. The color photos seen below are of the Bethany Church, near Somerset, PA, which he helped build in 1921-22. This is a story about my great-grandfather. He died before I was born but I can remember things my grandmother told me. When he was nineteen, he ran around with a group of boys who drank, played poker, and caused trouble in the town. The only church in his town was holding a revival meeting one night. This was a big thing in a little town. He was invited by a neighbor and that night, he converted his life to God. Then, he continued to attend church regularly, but his friends teased him and called him "Praying Billy." So, he started carrying his Bible wrapped in a newspaper. Later, he studied to be a minister and he carried his Bible out where everyone could see it. When he delivered his first sermon on a Saturday night, his friends hid behind the church and threw rocks against the building. They were chased away by some of the church members. The next time he was preaching, they threw rocks at the bell in the belfry. He traveled to church in a horse and buggy. Later, he bought an old Chevy, which he wasn't sure would make it home after church. He patched up many marriages, baptized babies, and held weddings and funerals. My grandmother told of times he traveled through heavy snow storms to church meetings and no one was present but him. Besides having his own church to take care of, my great grandfather traveled many miles over much of western Pennsylvania holding revival meetings. Several new churches were built under his service. Sometimes he held revival meetings and received enough money just for expenses. His family was large and many times they were short of food, but he had faith that God would help them through, and he always did. My great grandfather spent thirty-three years in the Lord's service and I am very proud when members of our church mention his name. I only wish I could have known him! Copyright © Elaine (Monticue) Brawdy. Published with permission.